Spend a lot of time Sitting & Thinking. Warren Buffett ‘demands’ it! 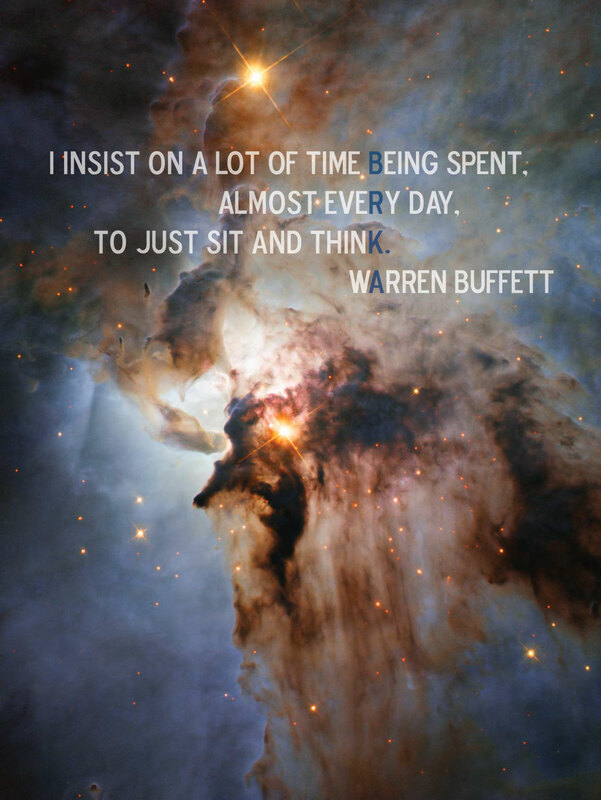 The following quote is perhaps my favorite saying from Warren Buffett. It’s a simple yet powerful formula that dictates most of his day. In other words, Warren Buffett demands it. He demands it! For anyone looking to learn from the investing wisdom of Warren Buffett, this is a good place to start. That’s why I made the picture below and hung it on my wall. It’s a reminder every day that this isn’t a recommendation. I must spend a lot of time reading and thinking. There’s a second reason why I love this quote; it’s unoriginal. In fact, you can trace the origins of this quote back through a long line of great men who unapologetically copied each other. Once again, John Locke likely derived this statement from influential thinkers he studied, such as Thomas Hobbes, Descartes, Cicero, Aristotle, and Plato. All of whom wrote extensively on the importance of thinking and meditating. Mastered the fundamental principles of value investing from Ben Graham. Mastered the fundamentals of the insurance business from Lorimer Davidson. Evolved as an investor by embracing the ideas of Charlie Munger and Phil Fisher. Warren Buffett has an uncanny ability to learn the best ideas that already exist and adopt them completely into his own knowledge and philosophy. This speaks volumes to the value of “cloning”. As investors, we should endeavor to do the same and master the best of what Warren Buffett has learned. We can start here.